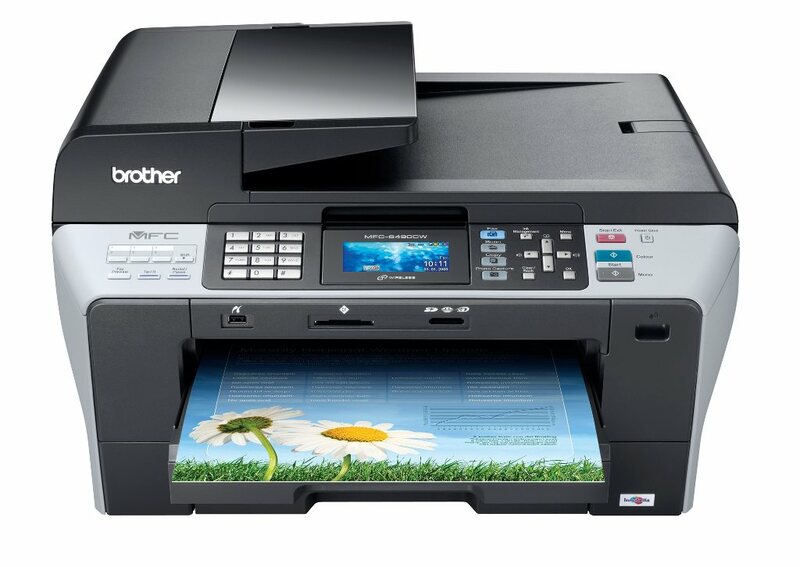 Brother MFC 6490 is a powerful device, printer 11x17 that will quickly produce high quality prints, copies, scans and faxes. Ultimate versatility at LOW cost. Ideal enterprise work solution for workgroups on large corporate campus or SOHO. Wireless All in One Printer. Built in 802.11 Wireless and 10/100 m bps Wired. YOU GET BOTH. Wireless all in one printer. Prints and copies on up to Ledger size (11x17) paper Copy speed 23 cpm. Professional grade up to 11 x 17 for high impact business applications. High yield four cartridge ink systems. Prints at up to 35 ppm black and 28 ppm Color. Max resolution is 6000 x 1200 dpi You may replicate the Masters. A very good Mona Lisa is within your reach. Use just the black ink and create engineering drawings. Ledger size map printing. WIFI protected security is easy as a push of the button. Built in Media Card Reader for quick photo printing. USB flash drive . Edit photos on the large LCD screen. Crane Binder has placed the original 11x17 printer carton into an outer brown shipping carton so it is double packed. Original box UNOPENED.Weight 42 lbs. Crane Binder Technologies is closely allied to engineering firms wanting to output 11 x 17 drawings for field use. Not only do we supply inkjet printers for ledger size but we specialize in the 11 x 17 accessories. Supplies for the 11x17 Brother printer include 11x17 desk trays, engineering ring binders, 11 x 17 index tab sets, sheet protectors 11x17, pre punched paper (free holes) and much more. Brother MFC6490CW is a reliable 11 x 17 all in one printer, Brother 11 x 17 Printer receive FREE support for the life of your product. Print sharp professional black and white pages with available large black inkjet. Fast reliable 11 x 17 printer designed squarely with the small office and home office user in mind. In 2014 Brother printers and All in One were recognized as #1 for reliability and #1 for overall satisfaction in the PC magazine Business Choice awards an annual reader driven survey on hardware, Software and services used in business environments. Free phone support for life of product. Elon Musk just successfully landed Space X rocket on water (4/8/2016) 11 x 17 documents output half size (22x34) Easy to walk engineering facilities . Reuseable rockets may lower cost of placing satellites into orbit. Four billion + persons on planet do NOT have internet access. Watch out here it comes. The Kingdom reigns. New product available at Crane Binder. Aluminum Storage Case for 11 x 17 documents . Famous POSSE BOX clipboard with storage. Large size. Strong clip on top of case. Project manager writes/walks on site field inspections. Tames construction project close out documentation.Phone 800 298 5555. Talk Posse box. Crane has used Brother printers at both locations for years. Amazed at years of service with no service calls ever needed. Just purchases of the consumables. We sell 11 x 17 paper by the ream and skid. Free holes on 11 x 17 paper.